Going through my archives, I found this post written from an O'Briens Sandwich Bar in Singapore. 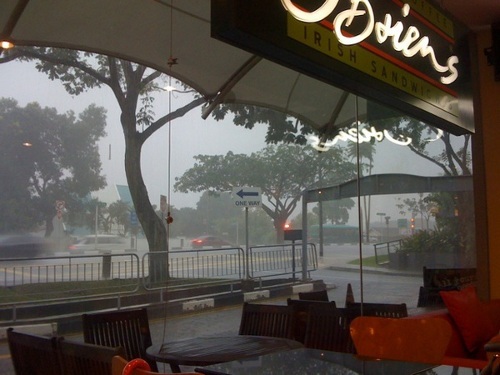 My dad and I had taken shelter in their Jelita branch after a particuarly nasty monsoon swept across the island, and we were more than a little fearful about driving on the increasily river–like road near Ulu Pandan. Another blog post from that time has some pretty unbelievable photos from that event. When I went back to Singapore in 2011, that branch had long since closed shop and moved on. In fact, much of the Jelita shopping centre looked completely different. I can still recall having birthday parties in the Pizza Hut upstairs. Sometimes after school, we'd get a cool drink at the 7-11, back when the Australian International School had its campus nearby. Then they moved the school again to Lorong Chuan, which we dubbed the biggest traffic island in Singapore. Last year, a bunch of us from Anime@UTS found ourselves at North Strathfield. Craving a bite to eat, we found an O'Briens Irish Sandwich bar, and proceeded to chow down. Despite being thousands of kilometres away, it tasted so good, and surprisingly familiar. I'll admit, part of me loves globalisation just because I can relive some childhood memories in a completely different part of the world. Even locally, if a branch of a store meant a lot to you, you can always go to another if the original closes shop. Sure, its not entirely the same, but nothing ever would be.